At Renaissance at 29th Apartments, we know you’re looking for an apartment that supports your modern lifestyle. That’s why we’ve updated our pet-friendly one, two, and three bedroom homes in Vancouver, Washington, to suit your unique needs. Come home to Renaissance at 29th Apartments and experience the life you deserve. Your new home features all the special touches you’ve been searching for. Experience the convenience of everyday essentials, like an in-home washer and dryer for easy laundry anytime. Fall in love with cooking in your fully equipped kitchen with a dishwasher for quick cleanup. Unwind at the end of a long day on your private patio or balcony, or curl up with a book by your wood-burning fireplace. Enjoy plenty of storage in your walk-in closets, and never worry about parking with your attached garage. Come live your best life. Schedule a tour today. We know that your expectations for luxurious living don’t stop at your apartment. 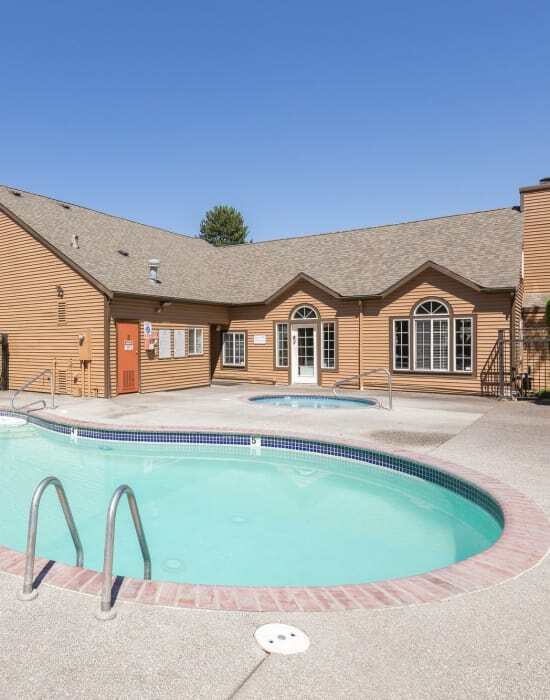 Renaissance at 29th Apartments offers you access to a wealth of community amenities. With an upgraded fitness center and basketball court on-site, you’ll never have to miss a workout. When you need to soak the day’s stress away, relax in our heated outdoor pool and spa. Dog owners will appreciate our beautifully landscaped grounds and our on-site dog park, where pups can run off-leash. Families will love having a playground where their little ones can play on sunny summer days. We also offer a clubhouse with WiFi, copy and faxing services, and package receiving at the main office.